Soft tissue deposits from head and neck cancer: an under-recognised prognostic factor? Jemy Jose, Alfio Ferlito, Juan Pablo Rodrigo, Kenneth O. Devaney, Alessandra Rinaldo, Ken MacLennan,	The Journal of Laryngology & Otology, Volume 121 Issue 12, pp 1115-1117. E B Chevretton, L Michaels, G Rottenburg, P S Phillips,	The Journal of Laryngology & Otology, Volume 121 Issue 12, p .
E Chevretton, L Michaels, I Clarke, G Rottenburg, F Vaz,	The Journal of Laryngology & Otology, Volume 121 Issue 12, p .
S Mylvaganam, C G L Hobbs,	The Journal of Laryngology & Otology, Volume 121 Issue 12, p .
C K Hari, R Powell, G M Weiner,	The Journal of Laryngology & Otology, Volume 121 Issue 12, pp 1135-1139. F Q Alzoubi, W R Ollier, R T Ramsden, S R Saeed,	The Journal of Laryngology & Otology, Volume 121 Issue 12, pp 1140-1147. G Magliulo, A Celebrini, G Cuiuli, D Parrotto, M Re,	The Journal of Laryngology & Otology, Volume 121 Issue 12, pp 1148-1150. H C K Lam, M C F Tong, C A Van Hasselt,	The Journal of Laryngology & Otology, Volume 121 Issue 12, pp 1151-1155. N Ogata, Y Darby, G Scadding,	The Journal of Laryngology & Otology, Volume 121 Issue 12, pp 1156-1160. Is electrogustometry useful for screening abnormalities of taste? E K Ellegård, K D Hay, R P Morton,	The Journal of Laryngology & Otology, Volume 121 Issue 12, pp 1161-1164. 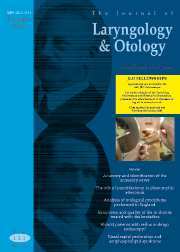 O Reichel, W J Issing,	The Journal of Laryngology & Otology, Volume 121 Issue 12, pp 1165-1169. S Maini, N Raghava, R Youngs, K Evans, S Trivedi, C Foy, G Mackintosh,	The Journal of Laryngology & Otology, Volume 121 Issue 12, pp 1170-1176. P Dong, X Li, Z Yu, G Lu,	The Journal of Laryngology & Otology, Volume 121 Issue 12, pp 1177-1183. J T Kennedy, P M Paddle, B J Cook, P Chapman, T A Iseli,	The Journal of Laryngology & Otology, Volume 121 Issue 12, pp 1184-1188. J Wasson, L Pearce, T Alun-Jones,	The Journal of Laryngology & Otology, Volume 121 Issue 12, pp 1189-1193. J Murphy, J T Murphy, A Sama,	The Journal of Laryngology & Otology, Volume 121 Issue 12, pp 1194-1196. S S Banerjee, K Lammin, J de Carpentier,	The Journal of Laryngology & Otology, Volume 121 Issue 12, pp 1197-1200. Fibro-osseous lesion of the middle turbinate: ossifying fibroma or fibrous dysplasia? O Galvan, E M Gassner, A Neher, A R Gunkel,	The Journal of Laryngology & Otology, Volume 121 Issue 12, pp 1201-1203. C Spyridakou, S Berry, J Phillipps,	The Journal of Laryngology & Otology, Volume 121 Issue 12, pp 1204-1206. A K Sharma, S Chatterjee, V L Sharma,	The Journal of Laryngology & Otology, Volume 121 Issue 12, pp 1207-1209. E Manor, N Sion-Vardy, M Nash, L Bodner,	The Journal of Laryngology & Otology, Volume 121 Issue 12, pp 1210-1212. P A Nix,	The Journal of Laryngology & Otology, Volume 121 Issue 12, pp 1217-1219. S Lloyd,	The Journal of Laryngology & Otology, Volume 121 Issue 12, pp 1118-1125. J T Johnson, A Ferlito, J J Fagan, P J Bradley, A Rinaldo,	The Journal of Laryngology & Otology, Volume 121 Issue 12, pp 1126-1128. D S Kim, P Cheang, S Dover, A B Drake-Lee,	The Journal of Laryngology & Otology, Volume 121 Issue 12, pp 1129-1134. The Journal of Laryngology & Otology, Volume 121 Issue 12, pp 1213-1214. The Journal of Laryngology & Otology, Volume 121 Issue 12, pp 1215-1216.